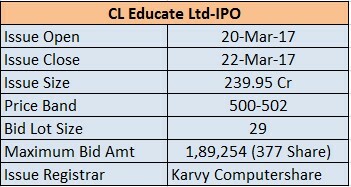 IPO of CL Educate opens from 20 Mar. 2017 to 22 Mar. 2017. The price band of Issue is Rs. 500 to Rs. 502. The fresh issue has an offer for sale of 25,79,881 shares (Rs. 238.95 Cr.). 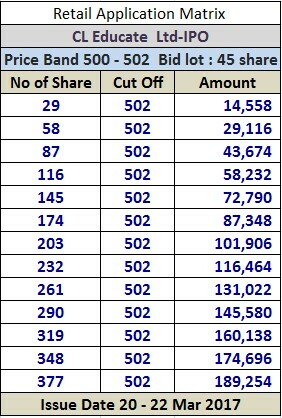 The minimum application size and bid lot 29 Equity Shares and in multiples of 29 Equity Shares thereof. CL Educate Ltd is a diversified and integrated technology-enable provide of education products services, content, and infrastructure, with a presence across the education value chain. The Company integrated business, marketing sales services for corporat e, conduct under brand Kestone, including event management, marketing support (including digital marketing), customer engagement, manage manpower and training services.